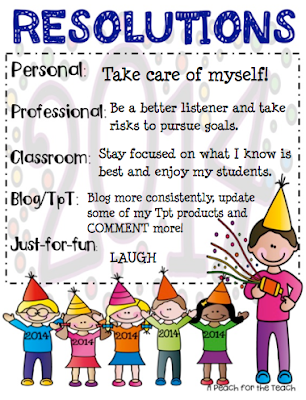 I'm linking up with A Peach for the Teach for a Resolution Link Up. In 2014, I'll be taking some "somewhat progressive" steps to take care of myself. because of the cancer history in my family. Transitioning to 40 this year, was a shock in many ways. Being 40 wasn't something that I worried about up to this year. to take care of my body at this age. I just need to work harder this year to take care of myself. That's the plan and I'm stickin' to it. Looking forward to a happy and healthy 2014 and wishing you all the same! 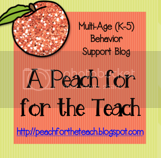 Please visit A Peach for the Teach to read some other resolutions! Hi, Kimberly! I liked reading your resolutions! I give you a lot of credit for taking care of yourself. Cancer is so scary and runs in my family, too. I need to laugh more, too. Great idea! Thanks for linking up! Great ideas! Good luck, happy new year!! It is so nice to hear comments from others. Thanks for yours and here is wishing you a Happy New Year! I love your resolutions. Good for you for wanting to take care of yourself. Sometimes it's hard to put ourselves before others but that's really what we have to do, isn't it? Good luck. Have a very happy new year!